A mere fifteen hours after a ruthless gunman opened fire on an innocent crowd in Thousand Oaks, California, the Woolsey Fire ignited about fifteen miles away near Simi Valley. Both apparently man-made events have devastated our community, and the week that followed has somehow been both blurry and unforgettable. After spending over a week at Pepperdine, however, I finally ventured off campus this past weekend to officiate a wedding ceremony about seventy miles away. Hilary and Tyler had planned to marry in Malibu, but like so many places in our area, their wedding venue burned to the ground. They kept their chins up and scrambled to relocate and successfully secured a gorgeous resort in Newport Beach to exchange their vows. I was Tyler’s dean of students at Pepperdine Law and was honored to do this for him and his lovely bride, but I confess a bit of mixed emotions when I left campus to drive to the wedding. It was literally a breath of fresh air to drive to Newport Beach and be with this lovely couple on their special day, but it was strange and hard to leave what felt like fellow soldiers battling on in such difficult conditions with so much work to do. It was jarring, and refreshing, and just plain odd to leave. But I am glad that I was able to go. I have now officiated eighteen weddings involving someone from Pepperdine Law, and each time I am struck by the great honor of having the best seat in the house. 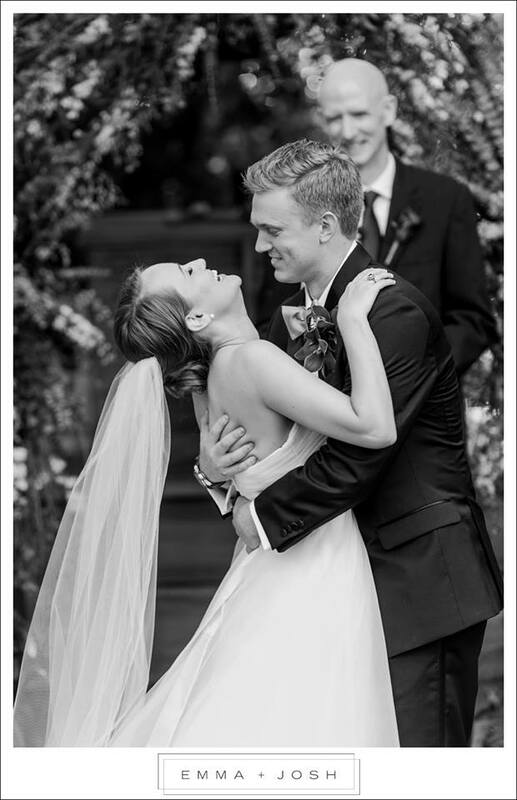 I get to watch the groom lose his breath when he sees his bride enter, and I get to see the bride’s heart melt when she sees the way her groom looks at her. I get to see them stare in each other’s eyes while I rattle on about whatever—and then nearly lose my own breath when I notice them actually listening to what they promise one another at such a holy moment. And this time I particularly noticed—in good times and in bad times. Wow. For better or worse, and in good times and in bad times. That has surely been on my heart this past week. The good times are easy and not worth the trouble of a vow. It is the bad times that call for a ceremony. I did not stay for the reception and got an early start on the L.A. traffic to return home. I could hardly wait to get back to everyone. For we have been in the throes of the bad times. When love is challenged to prove itself. At Mile One I am running down Santa Barbara’s legendary State Street where local shops intersperse the mega-chains: the “Only in Santa Barbara” souvenir shop sits ironically just past Macy’s. I stride by Anna’s Taco Kitchen and Whiskey Richards and notice a parking lot attendant semi-successfully attempting to stay awake next to a sign advertising the grand opening of Rusty’s Pizza Parlor, which doesn’t seem to generate much traffic at half past six on a Saturday morning. Even State Street Coffee is without a customer. At Mile Two I run by Santa Barbara Harbor and count the marinas down from four to one where sleepy sailboats sit silently like an ocean graveyard of naked flagpoles in the quiet of a new day. The unmistakable smell of bacon wafts deliciously from the Breakwater Café while busy workers in neon vests pickup Friday night’s trash to make way for the Saturday crowds. At Mile Three the tourist corridor has receded and I run southwest along the Pacific Ocean, listening only to my labored breathing occasionally punctuated by the squawk of a passing seagull. Elderly couples who dreamed of retiring on the American Riviera stroll by on carefully manicured and palm tree lined pathways, occasionally stopping to sit on the park benches facing the ocean where massive ships sit equidistant on the hazy horizon like a real-life game of Battleship. At Mile Three-point-Five I reach the mid-life crisis of my run. I am at the end of beautiful Shoreline Park and the beginning of what appears to be a normal residential area, as if residing along the Pacific Ocean in this remarkable city could ever be considered normal. It is time to turn around. I will see nothing new from here on. At Mile Four everything is the same but now seen from a different angle. The seagull still squawks, and the ships have not moved. At Mile Five the sailboats are yawning awake, and I am more tired than when I first noticed them as they slept. I still smell bacon. At Mile Six the first customer has arrived at State Street Coffee. The parking lot attendant is now walking laps to stay awake. I am now running uphill and noticeably perspiring. At Mile Seven my run is complete. I see my wife out for a morning walk as I return to the bed and breakfast where we are staying so that I can officiate a wedding this afternoon. It has been a good run. My wedding remarks are complete and printed, but I could say all I need to say just from this morning run. Life is exactly like a good, long run, and a wedding is an important mile marker along the way. Run well, my friends, and enjoy every step of the journey. This holiday weekend included the opportunity to officiate the beautiful wedding of two special friends. Top that. My wedding officiant experience is rather extensive, which now includes seven for law school folks with three more in the queue. In the early (read: pre-law school) years, my primary role was to keep the terrified groom from puking on his tuxedo prior to the ceremony (note: puke prevention responsibility presumably extended throughout the ceremony), but I have found that grooms with law school experience are a different breed–the Socratic method, law school finals, and the bar exam seemingly combine to make repeating after me in public far less intimidating. Brian could hardly stand it yesterday. Brian is typically a reserved sort of guy, the kind who holds his cards close to the chest, but when Stephanie appeared, illuminated by the Georgia late afternoon sunshine on the arm of her loving father, he almost had to sit down. We were all perspiring, but I am nearly positive that wasn’t perspiration happening inside his eyelids. If love really is all we need (and it is), and weddings are the most vivid expressions of love (and they just may be), then yesterday I had the best seat for the best moment in the best expression of the best thing in the entire universe. Yes, I am gloating. I am convinced that the best things in life are not for sale. My advice for you is to figure out what those things are and jockey for the very best seats. As per usual, I accidentally stumbled into this one, but I can promise you that it is better than anything available for purchase on StubHub.